This is my 97th final post on what I am going to hang on my powder room wall. Why do I angst about it? I continued to shop my house. 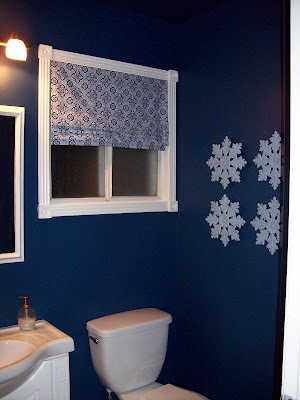 I thought the blue and white plates were too unstable for such a close area as the powder room. I had bought these cute metal plaques at HomeSense for $3.00 each. They were brown and I did a wash of blue over them and put them on the wall in my guest room, which is a work in progress. 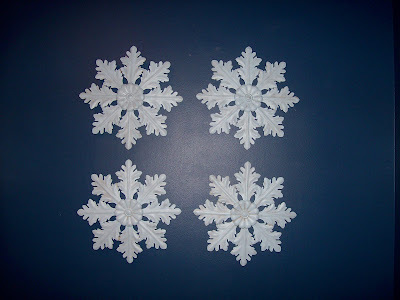 But I tried them in the powder room and I like the paler blue with the blind, the fact that they are really stable, and that they are not a square. So this room is done .... well I still need to change the light when I can find someone to help me and need to hang a towel rack when I find the perfect one ... but that barely counts. Don't you love to shop the house! I love to shop other people's houses!! I would love to see the cast iron base on your kitchen table. The very first line of this post made me laugh! I know the feeling of indecision SO well! Your room is beautiful, so it was worth the wait to make it "right"! 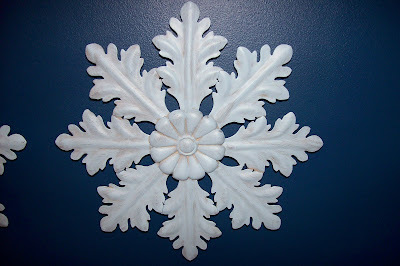 Love the blue and white...mine is also blue and white, but with white walls...yours is much more stunning! We are ALL alike! I can't make a final decision about anything- until I have tried a million things. But- that is the fun. I like how they mimic the pattern in your window shade. Very nice! I just noticed your comment. Thanks! I'm now following you. I'll be back to check it out (when it's not so late) and I'll link you. I love finding things at stores for next to nothing and spraying them within an inch of their lives! It looks very 'pretty in your potty' now! They look very pretty there! This is really nice and I like the choice of window blind too. Thanks so much for dropping by Beach Vintage. I like the look of those! And that roman blind...fabulous job! !